We do MORE than just cosmetic dentistry. Dr. Sekowska dedication to quality dental care goes beyond her training and techniques. Our cosmetic dentistry includes several services whose aim is to enhance and restore the beauty of your smile. An excellent solution to common problems such as tooth decay, teeth that are chipped and broken and other dental issues. If you are in need of dental crowns, we invite you to come to our Chicago Dental Office to see the difference crowns can make. Our dental office has a relaxed and pleasant atmosphere. Our dental team is professional and works well together, but we also love telling jokes and becoming friends with our patients. We enjoy making you feel welcome and comfortable in our office. We provide a full range of dental services for patients of all ages. As one of the best dentist you can find on N. Milwaukee Ave has to offer, she realizes patients want a comprehensive dental practice that can handle all their needs from routine teeth cleaning to the most complex dental implants. Dr. Katarzyna Sekowska: KS Dental Office. 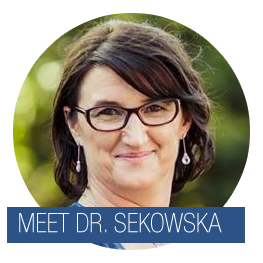 Katarzyna Sekowska offers Complete Dentistry for her patients so they can have healthy, beautiful smiles that will function properly and serve them for the rest of their lives. At KS Dental Office, we are fully aware of the hectic demands on your time. In light of this, we have structured our office hours to enable you to schedule an appointment at a convenient time.